There is no shortage of bad signals to test the tolerance of the TNC, with two local overdriven digis, and travellers through the area. The MFJ-1270B has handled the overdriven signals with greater tolerance than other TNCs that I tried (using AM7910, TCM3105, and MX615 modem chips). I have tested the TNC with its original firmware (TNC 2 1.2.7), and Paccomm v5.0, and UIDIGI 1.9B3, and it has worked properly with all of them. The TNC contains a circuit that asserts processor RESET when the input voltage is below 8.0V, the 5V regulator drops out at 5.9V input, and the 5V rail falls to 4V at 6.0V input. There is a 2.0V margin between the voltage that causes /RESET and 4V on the logic rail, so the design includes effective protection against low input voltage which might result in undefined operation including corruption of persistent storage. 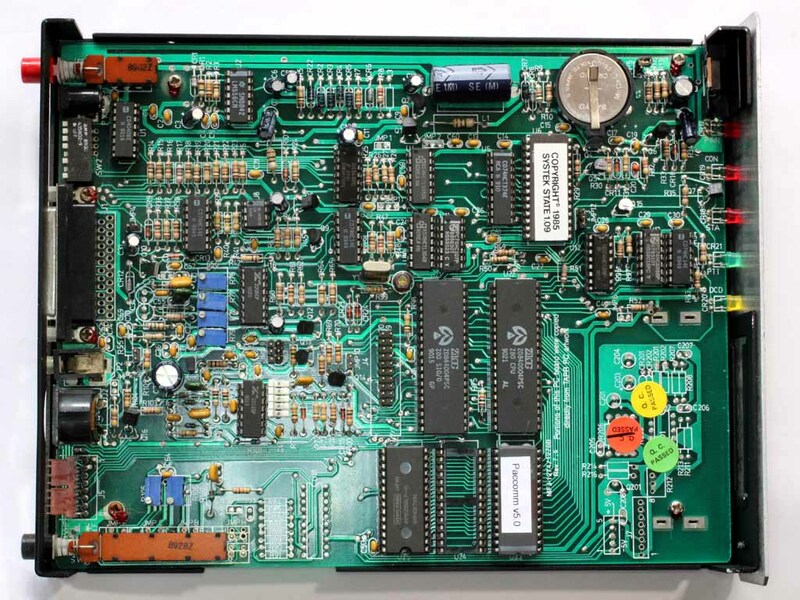 It is often convenient to be able to select between two application EPROM images in a TNC, and the usual method is to bank switch a 64kB EPROM, selecting either the high or low 32kB image with the A15 address pin. 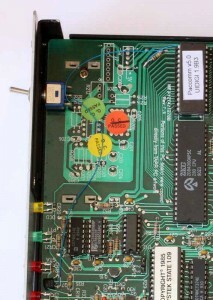 Above is a TNC modified for bank switching a 27C512 EPROM. A part of the socket for U23 has to be removed to allow access to the wide Vcc track underneath. This track has to be cut (without cutting others) so that a connection can be made to the LHS of the cut to supply Vcc to the rest of the track circuit. The same track has to be cut underneath the place where the 10kΩ resistor will be added (shown added), and the 10kΩ resistor soldered across the gap. The RHS of the resistor has to be wired to the LHS of the track cut under the EPROM, and the LHS of the resistor is wired to a switch to ground. When closed, it selects the low bank, and when open it selects the high bank. If you were fussy, you could wire a 0.1µF bypass cap from LHS of the resistor to a ground point to the right, but it seems to work quite satisfactorily without. 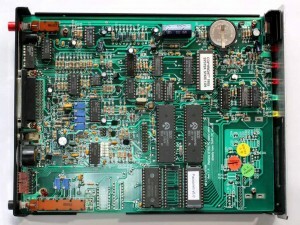 My recommendation for use with UIDIGI is to perform the bank switching mod described above, and burn an EPROM with a conventional TNC monitor that supports the CAL command for audio drive setup in the lower half, and UIDIGI in the upper half. UIDIGI does have a TEST command which will send an isochronous test signal, but it is not as flexible as the CAL command in TNC-2 monitors.